Monitoring New York State and local governments for gun legislation. Tirelessly making every effort to educate anti-gun politicians. Working with government officials to sponsor pro 2nd Amendment legislation. Keeping our members informed on politicians and legislation that will affect your 2nd Amendment rights. Rating politicians based upon their legislation and voting records to educate our members during elections. Maintaining a website with the latest information on news, legislation and events related to 2nd Amendment rights. Publicly speaking and debating gun issues with anti-gun politicians and anti- gun organizations. Attending numerous shooting sports events to increase awareness with all types of gun owners. We are made up of concerned gun owners and conservation clubs across New York. 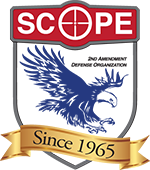 "SCOPE’s mission is to practice a strength in numbers strategy. A grassroots organization that values the talent and commitment of our members to advance our cause to preserve the Second Amendment rights of all New York State citizens. Our goal is to educate the public and public office holders on the principles of the Second Amendment and the wisdom of our founding fathers who saw this as a tool to guarantee our freedom."